I’ve been looking for some fun cooking projects that she might like and I think I might have finally hit the jackpot. “Chinese Street Food”, by Howie Southworth and Greg Matza, is a collection of recipes that try to capture popular street food across China, food that is the equivalent of Western casual take-out. Personally, I’m not in love with these titles. For the most part, I can’t remember what recipes are in most of the chapters. But I’ll forgive it because I want to try all the recipes anyway. The recipes probably most recognizable are mantou (steamed bread), biangbiang mian (table slap noodles), jianbing (pancake wraps), youtiao (fried dough stick), and (cong youbing (scallion pancakes). While I did not make the cured beef, I did try out one of the simpler recipes in the book. It was for peanut butter pancakes from the sweets chapter. The ingredients were straight-forward: all purpose flour, yeast, milk, sugar, brown sugar, salt, baking soda, eggs, oil, peanut butter, and soy sauce. I really liked this recipe! I’m not a huge “condiment” person so I only made a half-batch of the peanut filling which kind of reminded me of salted caramel. I’m also not a sweet and salty person because I’m weird like that. So when I make this again (and I *will*), I’ll probably just fill the pancakes with peanut butter or almond butter. The pancakes themselves were easy to make. They do require a little bit of planning because they are yeasted pancakes and need 90 minutes before cooking to bubble and rise. But that yeast gave it a spongy texture that I really liked. The yeast also adds a bit to the flavor. The only thing about the recipe that I didn’t like was I wasn’t sure how big these pancakes were supposed to be. I only knew that the recipe served 4-6, and I was supposed to use a small skillet with a lid. (Yes, a lid. These pancakes are not supposed to be flipped over. You use the lid to trap steam and help cook up the top. That was something that took me a bit to realize.) In the end, I used two small ladles worth (as in salad dressing ladle) and made about 8 pancakes. Pancake with filling. From the Chinese street food cookbook. Review is now on the blog. My overall impression of the book? I love it. And once you have what I consider to be the pantry ingredients, you are pretty much set to make a lot of the recipes. There’s a lot of repeat use of dark soy sauce, Chinese black vinegar, Sichuan peppercorns, sesame seeds, sesame paste (or tahini), soy sauce, star anise, etc. The recipes also don’t look too intimidating. I definitely recommend this book to anyone who wants to expand their knowledge of Chinese food, or someone who is looking for a fun new cooking project. Disclaimer – I received this book from Skyhorse Publishing for this review. I’m not getting paid for this post. The views and opinions expressed are purely my own. This post is dedicated to Martyna of http://wholesomecook.wordpress.com/. The pictures in this post were not taken with my really clunky and heavy digital camera. I recently acquired a Sony Cyber-shot DSC-WX9 as a result of some confusion and lots of generosity. From here on out, I have no good excuses for leaving my camera at home when I go to food events like the Harvard SEAS lectures. My WX9 is a travel-friendly small size. Sometimes, a person comes across something so intriguing that action must be taken up at once. I had that moment recently, and it was called Peanut Butter Rosemary White Chocolate Chunks cookies. Peanut butter and rosemary? When a blogger mentions being a trained pastry chef in a meme, you don’t take such odd recipe posts lightly. Asano-mama didn’t sound very optimistic about this recipe, which only fueled my determination. I set about making these cookies, starting even with the rosemary powder. I think the rosemary powder is an excellent idea in general. However, I admit that it was my stumbling point. After one whole hour, I only had 3 tsp of rosemary powder. Why? I was using a tea strainer as my “fine mesh” accessory, and this tea strainer had really, really small mesh holes. Plus, the strainer was a little deep for the size of my hands, which just made an arduous task more difficult. Oh well, 3 tsp was pretty close to the original 3 1/2 tsp requested in the recipe. The cookies came out just fine. So, back to the idea of peanut butter and rosemary – wow, they paired really well! Once I smelled the cookies baking, I knew that there was no question regarding the yumminess factor of these cookies. Straight out of the oven, the peanut butter pretty much was the dominant flavor. If I hadn’t known that rosemary was in my cookie, I might not have noticed it. The rosemary was delightfully subtle. Overnight, the rosemary flavor has gotten stronger, but nothing to worry over. 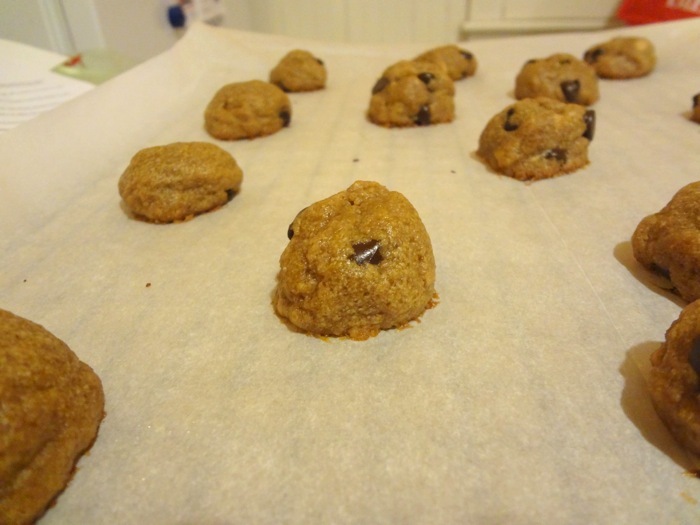 Without question, I’m keeping this cookie recipe in my favorites. And then this morning, I tried a batch of Trader Joe’s Cranberry and Oatmeal cookies. They’re “break and bake” cookies, except without the breaking part. These cookies are frozen in their individual, pre-measured amounts. And you know what? They’re wonderful. Great for when you need to impress people (or in my case, share with my cello classmates) but with very little effort. Such a stark contrast to my one-hour-making-rosemary-powder! Plus, it’s a nice change from chocolate chip break and bake cookies.